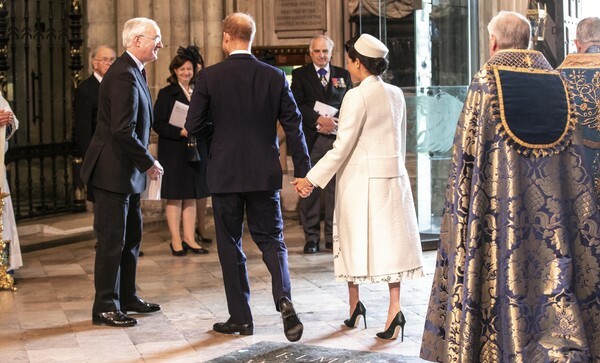 Prince Harry, The Duke of Sussex and Meghan, Duchess of Sussex arrive in Westminster Abbey during the Commonwealth day service on March 11, 2019 in London, England. Commonwealth Day has a special significance this year, as 2019 marks the 70th anniversary of the modern Commonwealth, with old ties and new links enabling cooperation towards social, political and economic development which is both inclusive and sustainable. The Commonwealth represents a global network of 53 countries and almost 2.4 billion people, a third of the worlds population, of whom 60 percent are under 30 years old. Each year the Commonwealth adopts a theme upon which the Service is based. This years theme A Connected Commonwealth speaks of the practical value and global engagement made possible as a result of cooperation between the culturally diverse and widely dispersed family of nations, who work together in friendship and goodwill. The Commonwealths governments, institutions and people connect at many levels, including through parliaments and universities. They work together to protect the natural environment and the ocean which connects many Commonwealth nations, shore to shore. Cooperation on trade encourages inclusive economic empowerment for all people - particularly women, youth and marginalised communities. The Commonwealths friendly sporting rivalry encourages people to participate in sport for development and peace.